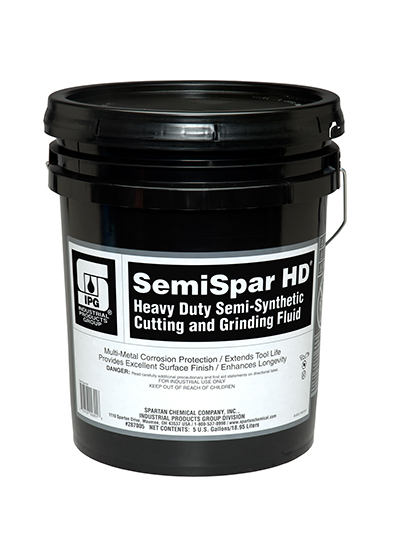 SemiSpar HD is a heavy duty, multi-functional, semi-synthetic cutting and grinding fluid. Designed for light, medium and heavy duty machining and/or grinding operations on even hard-to-machine alloys. SemiSpar HD provides multi-metal corrosion protection and excellent longevity in the machine or central system. Leaves a non-sticky, free-flowing, water-resoluble, thin film, corrosion protective residue on the machine and parts. SemiSpar HD provides the excellent tool life and surface finish properties on steels, stainless steel, carbon steel, copper, brass, cast iron and most space age alloys. SemiSpar HD's corrosion inhibiting package protects against surface deterioration due to rust, stain, or corrosion of steel, cast iron, aluminum, brass, copper, galvanized stainless steel and the modern alloys machined today.